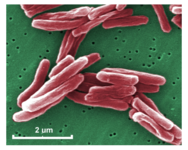 Mycobacterium Tuberculosis - M. tuberculosis is one of the most successful human pathogens. According to the World Health Organization about 1/3 of the world populations are carriers of M. tuberculosis. Through the emergence of antibiotic resistance strains together with an increasing prevalence of co-infection with HIV, tuberculosis remains a potent threat to public health worldwide. The pathogen has demonstrated a remarkable ability to deal with the host immune system: The T-cell driven host immune response results in M. tuberculosis persisting in the phagosomal compartments of macrophages for several years, even decades, without any symptoms. Despite intense studies on tuberculosis, the complexity of disease is still far from being fully understood. M. tuberculosis bacteria picture Scanning electron micrograph taken from ‘microbiology in pictures’.